Due to the planned migration of the Atlantic Ocean Region East (AORE) from 15.5W (I-3 F2 satellite) to 54W (I-3 F5 satellite), scheduled to take place on 30 October 2018 at 11:00 UTC, there will be a change in Inmarsat C coverage over the Greenland Sea between Greenland and Norway. The area in question is shown in cross-hatched green in the map below. This area includes part of NAVAREA 1 (coordinated by UK) and part of NAVAREA 19 (coordinated by Norway). 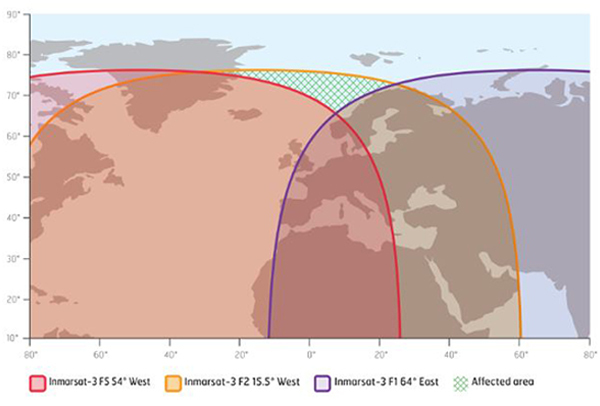 Note that this is a simplified map that shows only the 54W, 15.5W and 64E Inmarsat I-3 satellites. The 98W and 143.5E satellites do not cover the affected area, therefore, they are not shown here. Please also note that in our experience, Inmarsat C terminals are able to operate successfully below the nominal 5 degrees elevation contour shown in the map and may even operate down to 0 degrees elevation. What are the consequences for Inmarsat C service in the affected area? Vessels sailing in the affected area might be prevented from transmitting or receiving messages via Inmarsat C. This may impact both private communications as well as SSAS transmissions. Additionally, EGC messages might not be received by the Inmarsat C terminals while transiting or sailing in the affected area. Vessels reporting their positions to the shore-side for commercial (Inmarsat C tracking) or regulatory purposes (LRIT or VMS) might also stop reporting. When is the coverage expected to be improved? The Inmarsat C coverage in the affected area will improve after the migration of the Indian Ocean Region (IOR) from 64E to 25E, currently planned to take place around mid-December 2018. The period between the migrations of AORE and IOR is being kept as short as possible to reduce the impact on users. We currently expect this period to extend to about 6 weeks and will provide more information once we confirm the schedule. How does this change affect SOLAS (Safety of Life at Sea) and Non-SOLAS vessels? It is important to stress that it is a Global Maritime Distress and Safety System (GMDSS) requirement that all SOLAS vessels must have multiple communication systems (i.e. MF/HF DSC equipment, EPIRB, VHF, etc.). Therefore, SOLAS vessels will always have the ability to send and receive Distress, Urgency and Safety communications, even when they are outside the Inmarsat C satellite coverage area. All vessels (including non-SOLAS) operating in the affected area will receive an automatic alarm from their Inmarsat C terminals when they move outside the satellite coverage area. What Maritime authorities have been informed? The IMO, the SafetyNET panel coordinator and all member states have been informed via paper 14-4 at NCSR-5, submitted by IMSO. The migration programme was approved and is being overseen by IMSO. Inmarsat will advise NAVAREA 1 and NAVAREA 19 coordinators via notices to mariners of any notifications they should broadcast via non-Inmarsat C channels. We will also keep all end-users informed via Enhanced Group Calling (EGC) messages to their Inmarsat C terminals prior to each migration, with a minimum of six weeks’ notice. Inmarsat advises partners and administrations to contact all vessels operating in the affected area, to inform them of the potential degradation of service following the migration of AORE to 54W. What about other Inmarsat Maritime services in the area? FleetBroadband and Fleet Xpress services remain unaffected by the change caused due to the migration. Existing 505 emergency services will continue to be available on FleetBroadband. For further information and updates on the overall migration, visit www.inmarsat.com/i3-i4-services-migration. Alternatively, for any queries or concerns, please contact Inmarsat Maritime Safety (maritime.safety@inmarsat.com) or Inmarsat Global Customer Support (globalcustomersupport@inmarsat.com).